Calling all wildlife lovers! This incredible 12 day two-for-one adventure to Borneo is back by popular demand - this time, starting with two nights in the vibrant Malaysian capital, Kuala Lumpur to explore at your leisure, and giving you the best opportunity to see Borneo’s fauna and flora. Witness a morning orangutan feeding in the forest; learn about sun bears, the world's smallest bear, while observing them at the Bornean Sun Bear Conservation Centre; and visit the Labuk Bay Proboscis Monkey Sanctuary to see this unique primate up close. The fun doesn't stop there. On this tour, you'll explore the jungles, the beaches and the markets of Borneo. 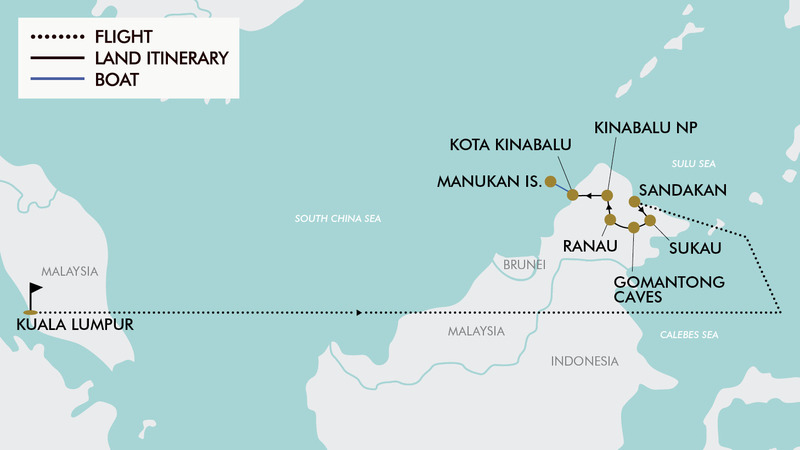 Enjoy three cruises along the Kinabatangan River, explore Kinabalu National Park on a guided walk, tour the fascinating Rainforest Discovery Centre and even go snorkelling at beautiful Manukan island. Plus, take the opportunity to visit the Sandakan War Memorial Park, the Nabalu Village markets and the Tanjung Aru Water Village, Penampang Local Market and cultural show among many other local attractions. Includes return international flights, 10 nights hotel and lodge accommodation, 25 meals (including a dinner in a Colonial-style teahouse), English-speaking tour guides and more. Today, depart from either Sydney, Melbourne, Brisbane, *Adelaide or Perth for Kuala Lumpur, Malaysia! Fly with award winning Malaysian Airlines. Upon arrival you will be met and transferred to your hotel for the next two nights. Today is free to spend at leisure exploring this vibrant city. This morning check-out of the hotel and transfer to the airport for the flight to Sandakan, Borneo. Upon arrival, be met by a tour representative and proceed to lunch at a local restaurant before being transferred to the hotel. Mid-afternoon you will be collected from the hotel to explore the various landmarks of Sandakan such as Central Market, with the most amazing variety of fresh seafood and agricultural products. Afterwards, drive through Sim-Sim Water Village before visiting the Puh Jih Syh Buddhist Temple which offers a panoramic view of Sandakan Bay situated on the hilltop of Tanah Merah. This evening enjoy a local dinner before returning to the hotel. Day 4 Sepilok Orangutan Rehab, Bornean Sun Bear Conservation centres & Labuk Bay Proboscis Monkey Sanct. After breakfast, visit the Sepilok Orangutan Rehabilitation Centre. On arrival, proceed to the outdoor nursery to witness the amazing conservation work being done. The nursery is where young orangutans learn to socialise and play with each other, all under the close supervision of their human carers. Afterwards, head to the feeding platform for the morning feeding and then watch a video presentation to understand further the objective/purpose of the centre. Next you will visit the Bornean Sun Bear Conservation Centre, which is home to rescued Sun Bears, the world’s smallest bear. Afterwards, enjoy lunch at a local restaurant. After lunch, drive to the Labuk Bay Proboscis Monkey Sanctuary (approx. 30mins) and witness the feeding of these endemic animals in their natural habitat. On a lucky day, one might also see the silver leaf monkey or a Bornean Hornbill. Drive back to the hotel and enjoy the rest of the afternoon free at leisure. In the evening meet in the hotel lobby and proceed for dinner at The English Tea House before returning to the hotel. This is approximately a 30km day. After breakfast you will visit the Rainforest Discovery Centre and explore one of Sabah’s finest examples of remaining tropical forest by experiencing the guided canopy walkway famed for bird watching or birding photography. After the guided canopy walk, proceed to the Botanical Gardens - home to at least several hundred both endemic and introduced plants - and conclude your visit at the exhibit centre. Mid-morning depart for Sukau at Kinabatangan (approx. 2.5 hours) and arrive in time for lunch and then check-in to the hotel. Enjoy afternoon tea before a river cruise in search of Proboscis Monkeys, Macaques and other fascinating wildlife that gather along the Kinabatangan River - the longest river in Sabah. Return in time to freshen up for dinner at the lodge. Wake up early this morning for a sunrise cruise to search for more wildlife. Cruise for approximately one hour with the option of a short jungle walk at Ox Bow Lake before heading back to the lodge for breakfast. After breakfast, depart Sukau for Gomantong Cave. Explore one of the largest limestone and bird's nest caves in all of Sabah. After visiting the cave, transfer back to the lodge to freshen up for lunch. Enjoy free time before meeting at the lodge restaurant for afternoon tea and embarking on the late afternoon river cruise to search for more wildlife, or alternatively relax and enjoy leisure time at the lodge. After breakfast, check out of the lodge and depart for Sabah Tea Garden Plantation (approx. 4 hrs) in time for lunch at Sabah Tea Garden. Then, after lunch, indulge in some free time at your leisure before enjoying a fish spa (foot massage) at Kampung Luanti. Enjoy dinner at Sabah Tea Garden Plantation. This morning, after breakfast, tour the Kundasang War Memorial Park. The park is made up of four beautiful gardens: the Australian Garden, the English Garden, the Borneo Garden and the Contemplation Garden and Pool, which represent the different nationalities involved in the Borneo campaign during World War 2. Enjoy lunch at a local restaurant before continuing to Kinabalu National Park for a guided walk in the Botanical Garden in search of native plants and wild orchids. Lastly, drive through the Crocker Range with amazing scenic views and along the way stop at Nabalu Village market to browse for local handicrafts, souvenirs and snacks. Check-in to the respective hotel and enjoy dinner at a local restaurant. This morning after breakfast, transfer to Marina Jetty to catch a ferry to Manukan Island. Enjoy swimming and snorkelling on this tropical island as well as lunch. After lunch, depart the island and return to the hotel to refresh before proceeding to visit Tanjung Aru water village where the houses are built on stilts over the water. From the walkway, visitors can have a good view of the islands of Tunku Abdul Rahman Marine Park and the Shangri-la Tanjung Aru Resort. There are around 3,000 villagers staying in some 240 dwellings on stilts. The tour will move on to Penampang, the hub of the Kadazandusun community. The main city of this area Donggongon is named from a kadazan word, tundo'ongon which means a 'shelter' or a 'resting area', referring to its historical role as a stop-over for people from the middle of the country who journeyed down the coast to trade goods at what is called a Tamu meaning ‘market’. After visiting the market proceed to ‘J Borneo Native Village’ for dinner and a cultural show. After dinner, transfer back to the hotel. Today is free to explore the town of Kota Kinabalu at leisure. This morning check out of the hotel and, at the appropriate time, be transferred to the airport for your return flight back (via Kuala Lumpur) to Australia. Please note: Due to flight scheduling, some Brisbane departures may arrive back to Australia on the evening of Day 11, not Day 12. Travel offer is valid for travel on selected dates until the 28th August 2020. Please be advised, 1 voucher is valid for 2 people. When processing your order, please double check the number of allocations you are purchasing is what you require. Please note: dates/months with a * incur a flight high season surcharge of $300 for 2 people. Malaysian Airlines plus any codeshare partners. - Valid for Children/infants 4 years old and over. 2 x Single beds or 1 x Queen/King bed (subject to availability). Minimum group size 16, maximum group size 26 per vehicle. - Visa fees and requirements (A 90 day tourist visa will be granted upon arrival into Borneo if travelling on an Australian Passport). - Malaysian Tourism Tax: 10 RM (approx. $3.5 AUD) per room per night collected on tour. The Malaysian Customs Department ("RMCD") is imposing a Tourism Tax on non-Malaysian guests at the sum of RM10 (approx. $3 AUD) per room per night (approx. $27 AUD total) with effect from 1st September 2017. This Tourism Tax will apply no matter if the booking was made before or after the announcement. The Tourism Tax is not applicable on Malaysian citizens (MyKAD holders) & Malaysian Permanent Residents (MyPR card holders). Kindly please take note that the Tourism Tax will be collected directly from the tourist(s) locally upon check out from the resort/hotel/lodge/chalet. As part of the Sabah area, Kota Kinabalu features a typical equatorial climate with constant temperatures. Kota Kinabalu's average temperature ranges from 26°C to 28°C. April and May are the hottest months, while January is the coolest one. The average annual rainfall is around 2,400mm and varies markedly throughout the year. March is the hottest month in Kuala Lumpur with an average temperature of 28°C and the coldest is January at 27°C with the most daily sunshine hours at 8 in September. The wettest month is November with an average of 290mm of rain. 25 meals are included in the tour, for all other meals; lunches and dinners the tour leader (when available) will offer assistance with reservations, suggestions and directions to local restaurants. It is your responsibility to notify TripADeal of any dietary requests/requirements. Please note; we will do our best to meet your requests/requirements, however cannot guarantee that we will always be able to. Gratuities (tips) are not included in the tour price for services of the tour leader (when available) and driver throughout the tour. Tipping is optional and at the customer’s discretion while on tour. A 90 day tourist visa will be granted upon arrival into Borneo, Malaysia if travelling on an Australian Passport.